The Boston Red Sox have been cruising as of late, building upon their recent dominance with a 10-5 victory against the Los Angeles Angels on Sunday afternoon. Leading the way for Boston was Jarrod Saltalamacchia, who has served as the starting catcher for the Red Sox for the past three seasons. Saltalamacchia belted two home runs on the afternoon, a 427-foot bomb to center field in the sixth inning, followed by a three-run blast to center once again in the seventh, giving Boston a 10-3 lead at the time. Saltalammachia finished the game 2-for-4 with two homers and four RBI, improving his seasonal totals to eight home runs and 25 RBI along with a .273 batting average in 49 games. 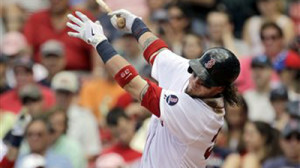 Accompanying Saltalamacchia’s blasts were two others from David Ortiz and Mike Carp. Ortiz took Angels starter Joe Blanton deep in the third inning, slugging a three-run shot to right center, scoring Daniel Nava and Dustin Pedroia. Carp would add a solo homer in the sixth, cementing a 6-3 lead for Boston at the time. Since an 11 game stretch at the beginning of May that saw Boston lose nine of those games, Boston has posted a 17-8 record and have surged back atop the AL East standings, holding a two game lead over the New York Yankees with an American League-best 39-25 record. Following a late-season collapse in 2011 and an absolutely dismal 2012 campaign, the Red Sox appear to be having fun again. Boston will travel to Tampa for a three-game series that commences tomorrow night. The Red Sox won their last series against the Rays, taking two of three games in the mid-May match-up.